For a large percentage of users, iPad Pro is regarded as a ‘too large-sized tablet’ that is not very convenient to use and carry around with you. But for the artists, the iPad Pro in conjunction with the Apple Pencil is a great drawing tool. In particular, because this is a pressure sensitive pen tablet and the screen is almost as large as an A4-size page. First of all, the iPad Pro is twice as powerful as the iPad Air 2, therefore, there is no delays or slowness in the drawing. It was a troublesome problem in many drawing apps on the older iPad models. 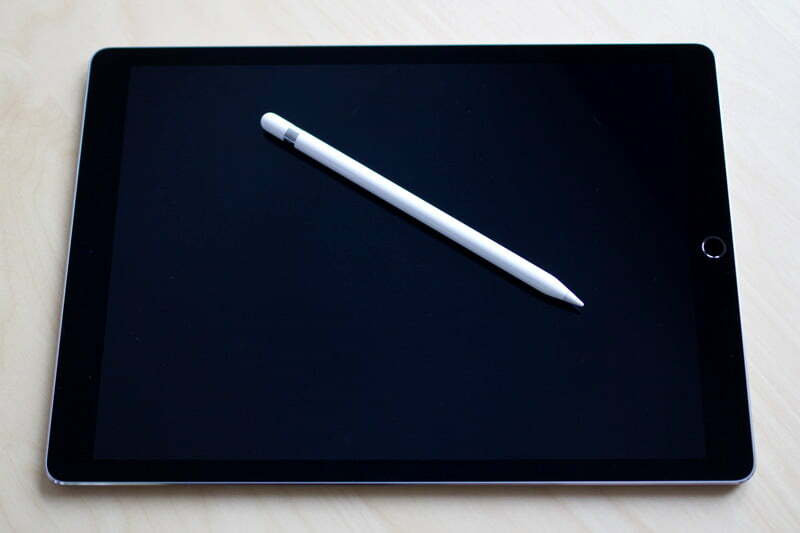 This time, this article will be about the Apple Pencil and how it is in comparison to the artists’ other favorite tool a graphic tablet Wacom Intuos Pro. This tablet gained its popularity due to its lower price against the Wacom Cintiq – Which would likely be the tool of choice if it wasn’t so expensive. However, the iPad Pro in unison with the Apple’s Pencil could be a good alternative even to the desirableWacom Cintiq. Some may argue that ‘on the iPad it is impossible to use popular graphic software packages such as Sketchbook Pro, Photoshop vai Corel Painter. Nonetheless also on the iPad Pro there’s some good drawing applications such as Procreate, Sketch Club, Sketchbook. If you still want to use the same software, where you are drawing on your computer, it can be achieved through an Astropad app. It costs 19.99 euros or dollars and works only in conjunction with Mac computers. The Apple Pencil embeds very conveniently in the hand, because it is the same size as a usual pencil, only heavier. However for convenient use and serious drawing results, it is necessary to devote the time to experiment with the digital brush settings. If you are going to use the same brush, which works well with the Intuos Pro you will not get the desired result. The Apple Pencil and the Intuos Pro use different technologies, so each will work better with its own brush settings. For a ‘drawing on a paper feel’, the solution could be to cover the iPad Pro screen with a matte anti-glare film. It eliminates the reflection on the screen and it feels like the digital pencil slides along the surface the same way as a pencil on paper. Also, the strength of pressure is easier to control and there are fewer clumsy and unwanted drawing lines than when drawing on the slippery glass like surface. Another thing that concerns future Apple Pencil users is, whether the palm touching the iPad Pro screen before the digital pen will leave unwanted points or streaks on the drawing? This will be dependent on the drawing application. For instance, an app like Sketch Club is very troublesome, but in the Procreate app settings you can activate the Palm Rejection function, which should avoid this problem. However, it does not eliminate the problem completely. The best solution is to take a cheap glove and cut off three fingers, put it on your hand and the problem of unwanted lines from the palm pressure can be completely forgotten. In the comparison of the two previous Apps in the Astropad app, this problem does not exist. The fingers can only zoom in a drawing or press extra buttons on the app, which is displayed on the left side of the screen according to your wishes. The brushes, colours or other tools in this app can only be selected and used with a tap of the Apple Pencil. It is very nice that in some drawing applications, such as Procreate the angle in which the Apple Pencil is placed against the screen is also recognised. This allows changing the thickness and the angle of the drawn line and will create a more realistic look, just like when drawing with a real pencil. For those who are in the habit of turning around the Intuos Pro stylus pen when using an erasing function will have to get used to the Apple Pencil not having the eraser on the other side of the pen. I personally never used erase this way, so the lack of this function does not bother me. In conclusion, I have to say that the iPad Pro with the Apple Pencil is a good digital drawing tool. However will I be ready to withdraw from the Intuos Pro graphic tablets in favor of the iPad Pro and the Apple Pencil? Not yet. More time is needed to experiment with the iPad Pro in order to understand whether it is able to replace my good, old friend Intuos Pro. Hey Gatis! Love your work. I just got the iPad pro, I’m having some trouble adjusting to it. Can you let me know what’s your art process? Do you draw it first on a piece of paper and then you bring it on the iPad? Hi! Thanks! Yes, mainly I am drawing on paper, then make photo with iPad, import in drawing app and draw on layer above it.